When a dinner is made with mainly pantry ingredients and only requires one skillet, you know it’s a winner. 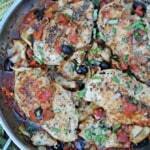 My family considers this Mediterranean chicken skillet a winner winner chicken dinner. There’s nothing really fancy about this dish. Really there’s nothing really fancy about any of my meals, but they are fast, easy, packed with flavor, and healthy. Like I often say, “simple dinners get the job done”. 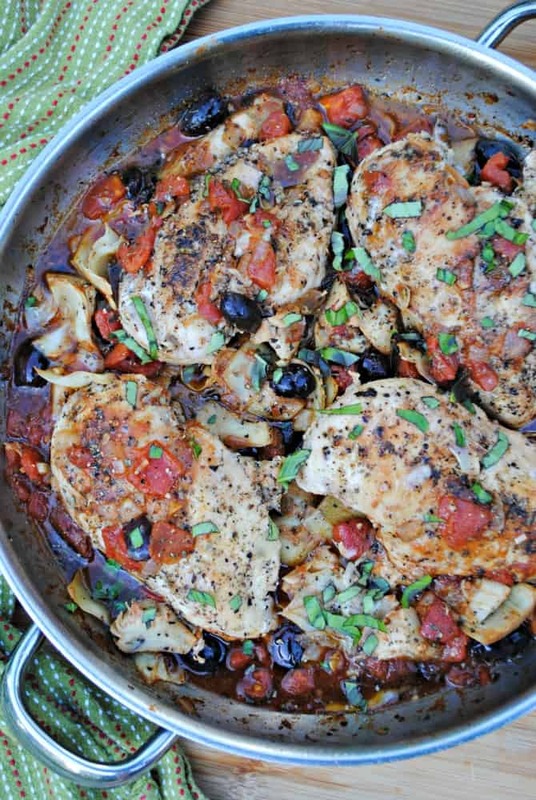 I almost always have chicken breasts and chicken thighs in the freezer and olives, artichoke hearts, and tomatoes in the pantry. This dish can be whipped up in a flash when all of the ingredients are on hand. I’ve never tried it, but I feel pretty confident you could also make this in the slow cooker or pressure cooker for an even more hands-off approach. The chicken may shred if you cook it in the slow cooker though. I prefer it made in the skillet, but you do what works best for you! I usually serve this Mediterranean chicken skillet with a nice spinach salad, but you can pair it with whatever you like! Roasted veggies, pasta, or rice would all be lovely. Chicken breasts jazzed up with flavorful pantry ingredients. In a large skillet brown chicken in olive oil over medium heat. When browning on the second side, scoot chicken over and saute onion and garlic. Remove chicken when well browned and set aside. 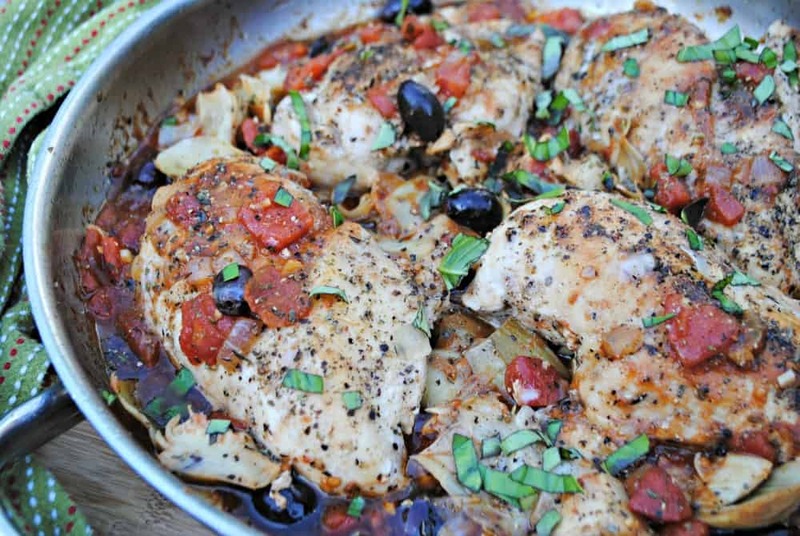 Pour in diced tomatoes, artichoke hearts and olives and deglaze pan by scraping up the brown bits. Stir, add back in chicken, and spoon sauce on each chicken breasts. Put a lid on the skillet, reduce to low, and simmer for about 10-15 minutes or until internal temp of chicken reaches 165 degrees F.
Taste sauce and add more seasonings if desired. The olives make it pretty salty, so taste first. If you have extra room in the budget, you can serve with more fresh herbs and feta on top for garnish.